as requested, moved to the recycling bin. Do something constructive and do it Llama. if i knew how to, i surely would, TeeGee. Photoshop is generally the best thing, although some prefer Gimp. Then find someone to do the xml side of it for you. There's still a number of people here who can do that. How much XML work will be needed on this map in order to make it Beta? I don't know the first thing about XML. I'm not sure who's active and does. Maybe WidowMakers, grifftron. There are others I just don't know who. iAmCaffeine wrote: I don't know the first thing about XML. Learn - if you're clever enough to dox, you should have no problem learning xml... . you can do it!!! I guess you have no clue what you're talking about. I'm not into coding, which is what XML is. It's also harder to learn than a simple dox. I would be happy to do XML if it got going again. Swifte wrote: I would be happy to do XML if it got going again. I would be willing to help as well. The XML is in the first post about 3 pictures down. Likely already complete just abandoned. HOORAY for Swifte, Jd & HR!!! riskllama wrote: HOORAY for Swifte, Jd & HR!!! woot woot. the xml is done which is great. i haven't read through the thread but the map on the first page looks like pumpkin pie w/ a somewhat easy set up. Are there no layered files? probably not. I'd venture to say that that'll take about a week or two (after hours) to bring it back in all it's glory in terms of gfx. I would found this version most advanced and much more tough to play as this one, pamoa use to be playing with LHDD but left the site a while ago...graphics looks good but will be tough to retrieve the xml...perhaps using the map layout and recreate the xml? Aesthetically, I prefer the one in the OP, but in terms of gameplay it's awful. Pamoa's is prob better. Well, if it is almost complete but abandoned, what still needs to be done on the original map? By XML code Schaffhausen is part of the Northeast (yellow) bonus. See code far below. By the "Bonuses" map on the left Schaffhausen is part of the Bern Dominion (gray) bonus. See link below. On the main map Scaffhause is 2 colors! Solidly gray with a thin strip of yellow along the bottom. Best to make the island like extention more yellow ON BOTH MAPS to avoid player confusion. 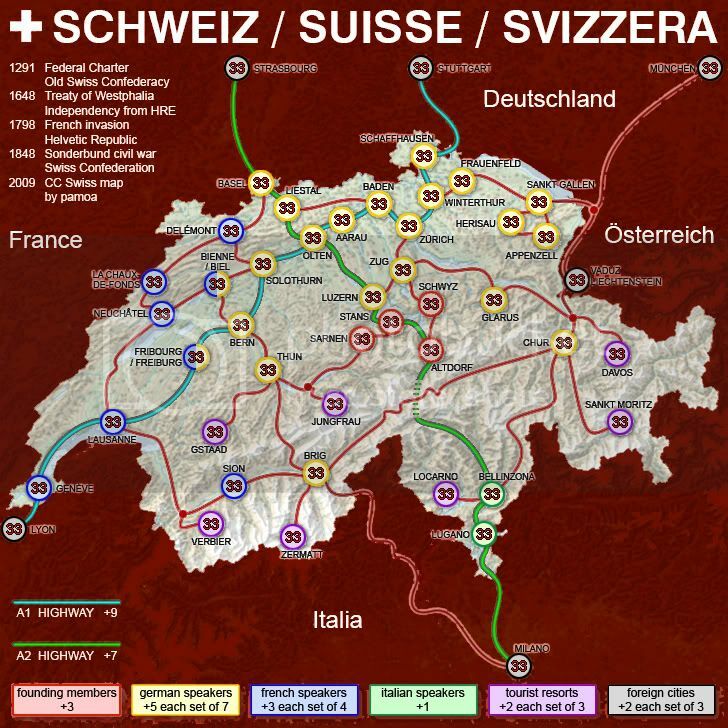 I will be using "Reborn Switzerland" in the subject to show new life. Correct the 28 above and then it didn't like the "<title> not expected here" in the XML. This even had coordinates and a JPEG. Last edited by HitRed on Wed Jul 25, 2018 7:28 pm, edited 3 times in total. The XML is missing the minreinforcement so that has been added. There are 30 terr. on the map so keyed that in. Test results were good BUT reads 31 terr.??? Checking on it. OK, the writer included Chur in the coding twice. All the text and coordinates are the same. Removing 1 of them.